» Articles » Trees » Saucer Magnolia: Tree or Shrub? Saucer Magnolia: Tree or Shrub? 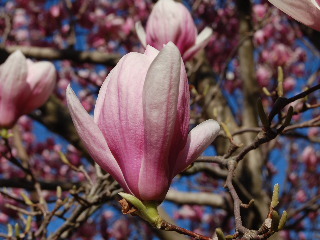 It’s a tree, it’s a shrub, it’s a flowering ornamental—saucer magnolia (Magnolia soulangeana) answers to all three! And, saucer magnolia is easy to live with—its demands are few while its rewards are many. A desirable addition to both home and commercial landscapes, saucer magnolia is a deciduous shrub or small tree that produces colorful blooms in the early spring—long before its shiny green leaves emerge. The blossoms range in color from white to several hues of soft pink. By combining the 2 trees, you get the advantage of an early spring flowering tree and a year-round evergreen tree that produces beautiful and fragrant blooms as the season progresses. For commercial landscaping projects, saucer magnolia works well in urban locations as it is relatively unaffected by air pollution (automobile exhaust and industrial contaminants). And, even though the saucer magnolia is known primarily for its early and colorful blossoms, the stark shape and gaunt structure of the leafless tree provides a striking almost sculpture-like appearance against modern architectural installments of glass and steel. The tree is undemanding of soil types, maintaining healthy growth rates even in less than ideal growing mediums—although moist acid soils are preferred. Also, it is tolerant of some shading even though the species does prefer full sunlight. One word of caution—be very careful in pruning this species. In other words, unless there is dead or damaged wood within the tree—just leave it alone. 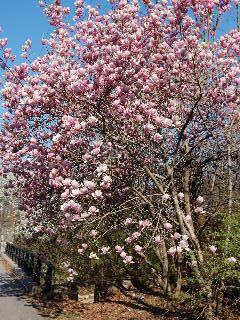 After all, much of the beauty of saucer magnolia lies in its dense and free-flowing shape, both leafed and leafless. Also, this unfettered and sometimes asymmetrical denseness of the tree provides desirable cover to wild birds. Some say the “saucer” name comes from the somewhat flat, saucer-like shape of the blooms, although it appears to me the tree could just as easily be called “cup” or “mixing-bowl” magnolia! However you want to describe them, the striking blooms add early color to your landscape in the spring. The dark green leaves are beautiful throughout the summer. And the shapely and leafless “skeleton” of the saucer magnolia stands throughout the winter like a well-crafted horticultural statue in the living museum that is your home garden! So, whether you choose to call it a tree, a shrub, or a flowering ornamental, it doesn't really matter--the saucer magnolia is a great plant to enjoy year round.